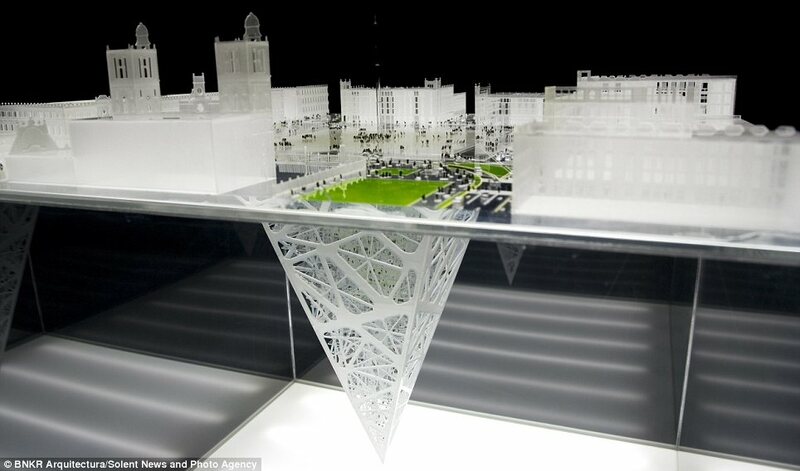 Architects have designed an incredible 65-storey 'earth-scraper' which plunges 300 metres below ground. 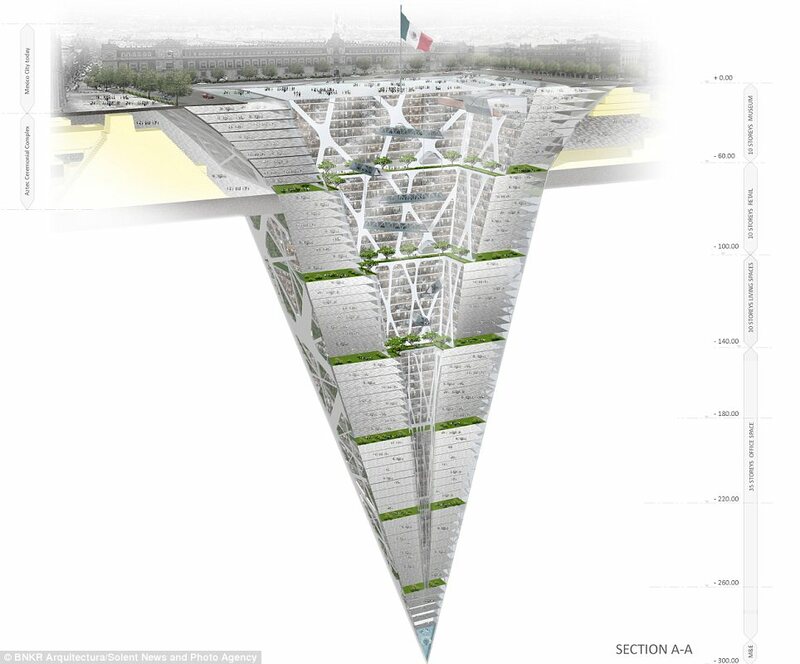 The stunning upside down pyramid in the middle of Mexico City is designed to get around height limits on new buildings in the capital. 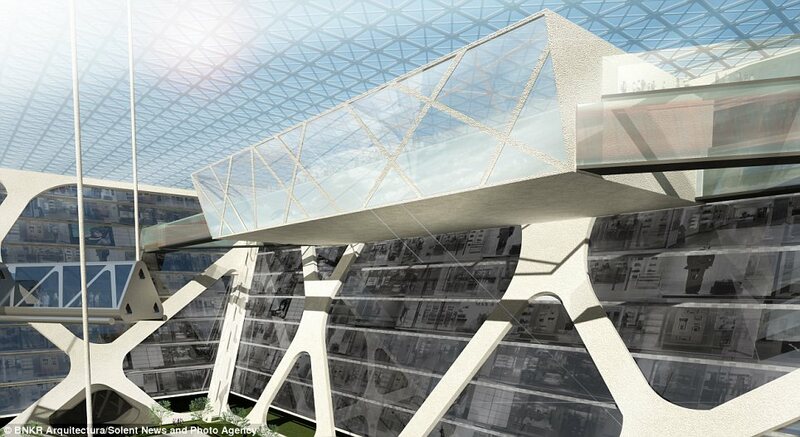 The subterranean building will have 10 storeys each for homes, shops and a museum, as well as 35 storeys for offices. 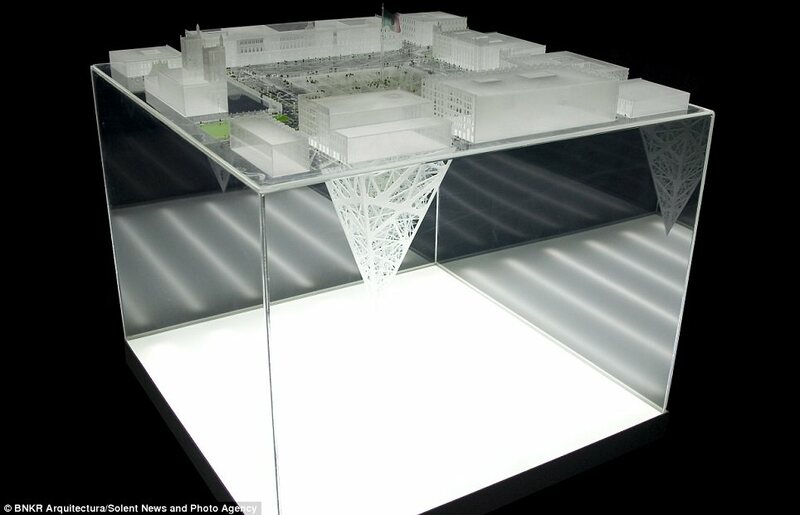 A glass floor covers the massive 240m x 240m hole in the city's main square to filter in natural light from the world above. 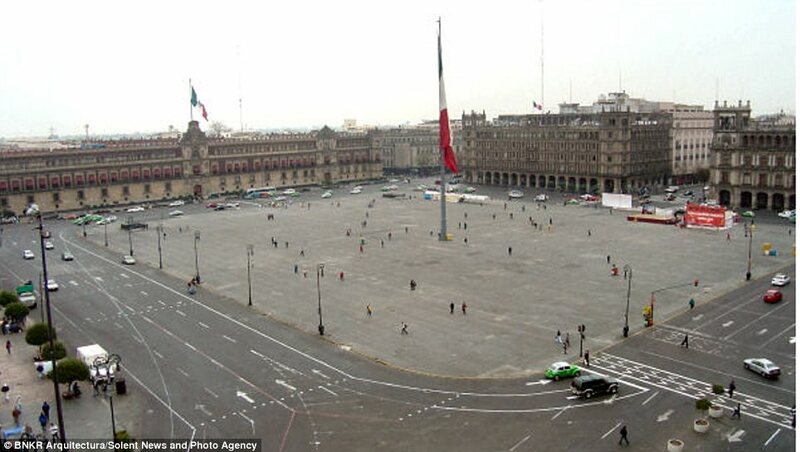 The design has been crowned with a Mexican flag. 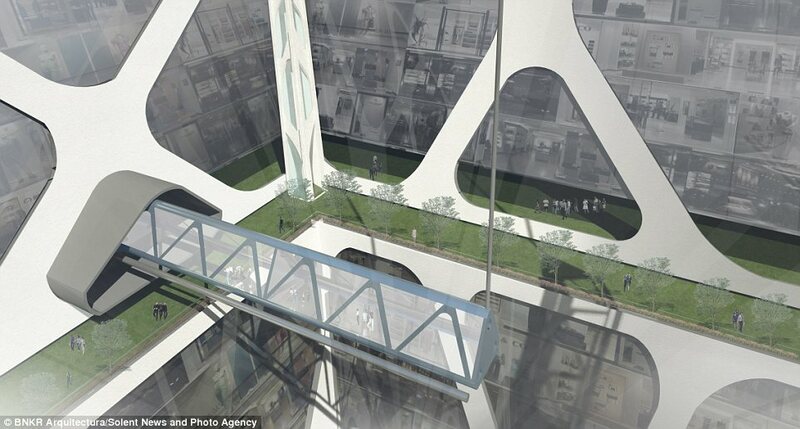 Esteban Suarez, from architecture firm BNKR Arquitectura, said the building would also house a new cultural centre. He said: 'New infrastructure, office, retail and living space are required in the city but no empty plots are available. 'Federal and local laws prohibit demolishing historic buildings and even if this was so, height regulations limit new structures to eight storeys. He added: 'The Earthscraper preserves the iconic presence of the city square and the existing hierarchy of the buildings that surround it. 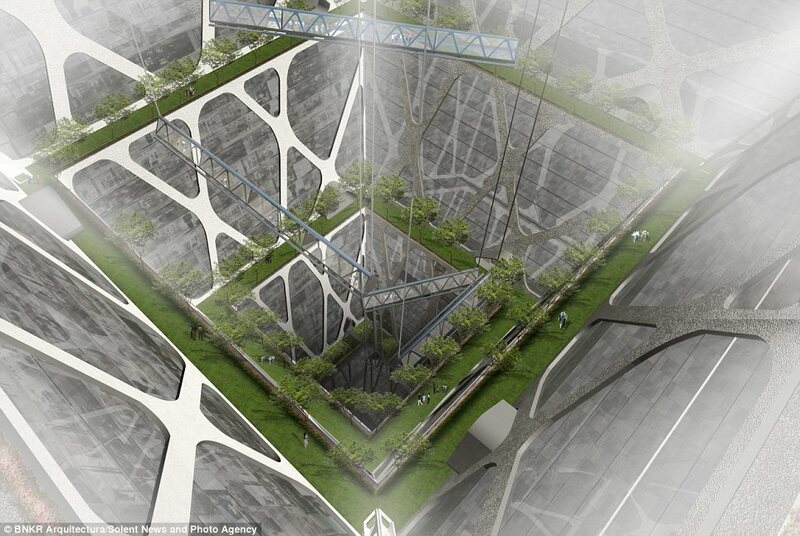 'It is an inverted pyramid with a central void to allow all habitable spaces to enjoy natural lighting and ventilation. Pyramids play a large part in the architectural history of Mexico, as the country's anicent civilisations have often build huge pyramid structures. When the Aztecs first came into the Valley of Mexico they built their pyramids on the lake they found there. As the Aztec Empire grew in size and power they conceived a new and bigger pyramid, but instead of looking for a new site they just built it on and around the existing one. The traditional pyramids are therefore composed of different layers of historical periods. When the Spanish arrived in America and ultimately conquered the Aztecs, they erected Christian churches on top of the pyramids. Eventually their whole colonial city was built over the Aztec one. In the 20th century, many colonial buildings were demolished and modern structures raised on the existing historic foundations.